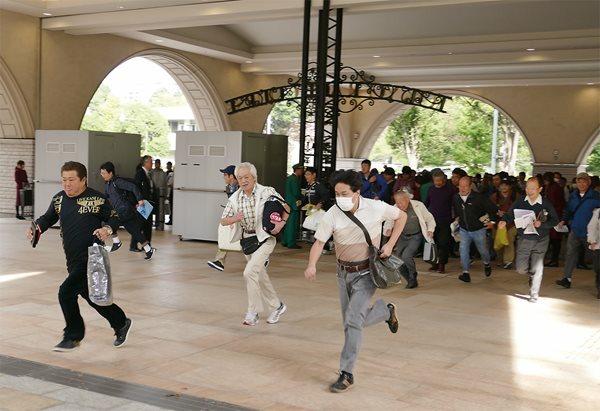 Coming up from third in the 2015 Saudi Arabia Royal Cup race at the Tokyo Racecourse, Brave Smash (6) shows a burst of speed that seconds later noses him first over the finish line. 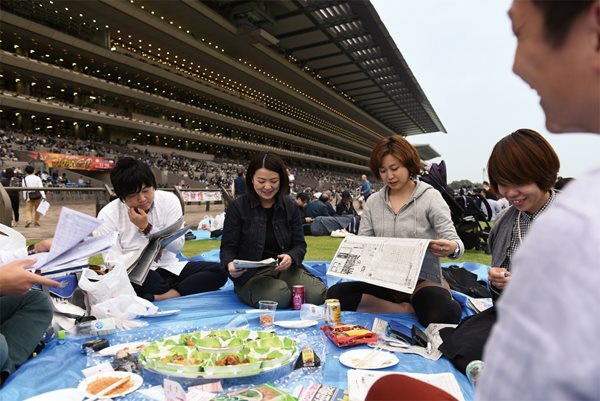 Spectator gates open at precisely nine a.m., and fans have a race of their own to claim favored spots for viewing the day’s lineup of a dozen races capped by the Royal Cup. 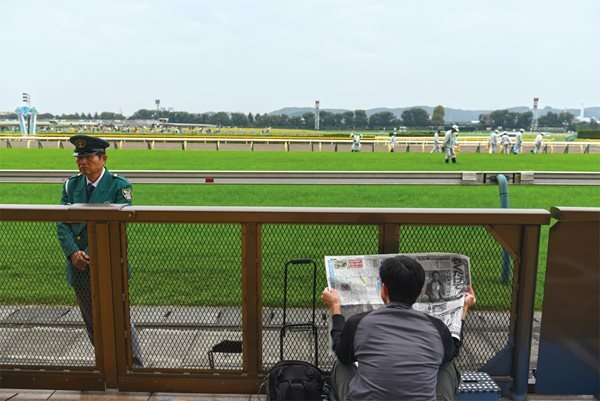 Trackside viewing secured, an early bird reads a program while groundskeepers check the turf track of the world’s largest horse racing stadium. 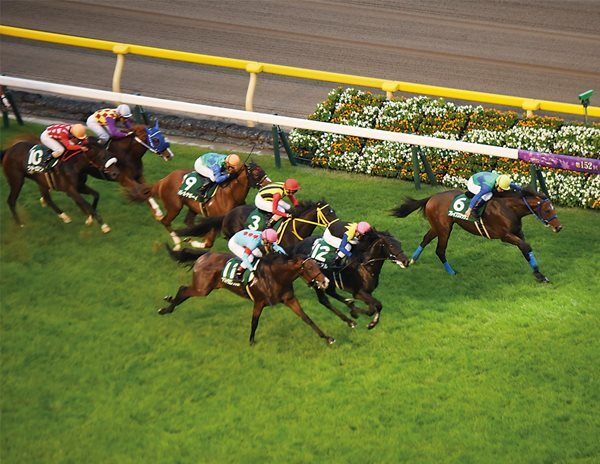 Horses finish one of the early races on October 10, 2015. 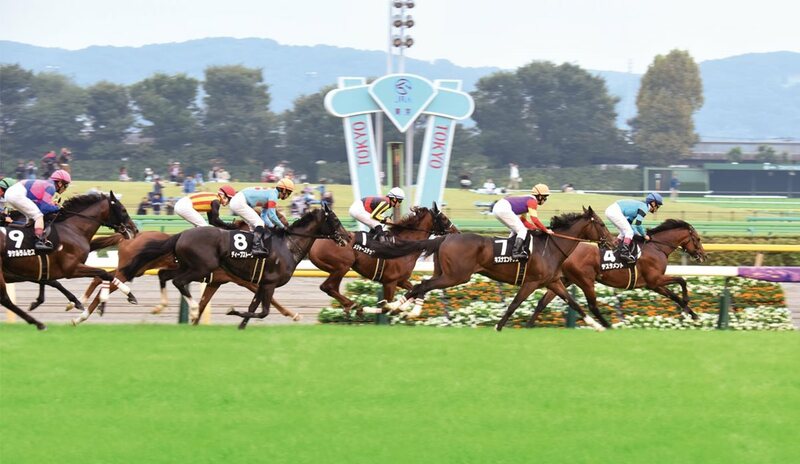 The first time a thoroughbred from Saudi Arabia raced in Japan was in 1989. 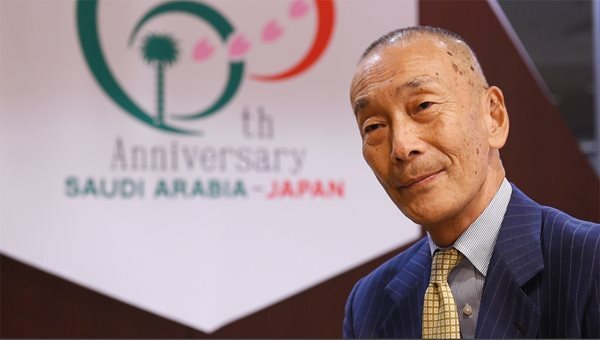 Named Ibn Bey (“Nobleman’s Son”), he and his strong showing inspired the ideas for both the Saudi Arabia Royal Cup and a sister race in Riyadh, the Japan Cup, now in its 14th year. 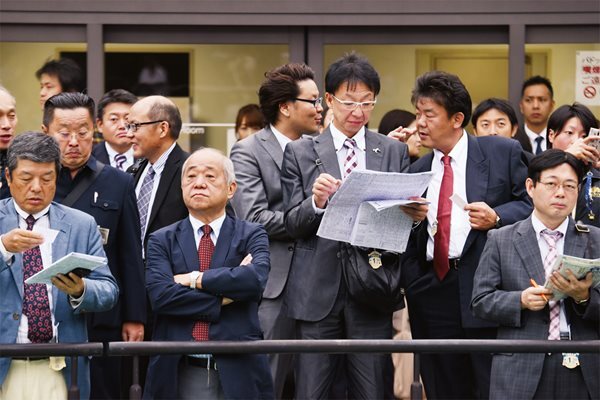 Businessmen and horse owners watch from a private section. The Saudi Arabia Royal Cup's trophy is the only one in Japan that comes officially from a head of state. 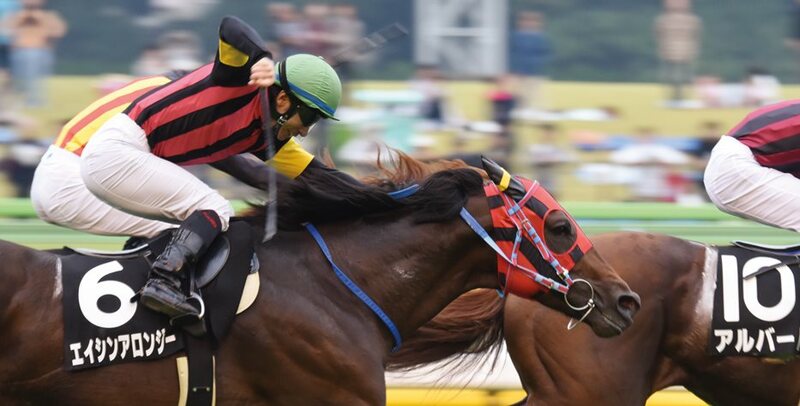 Straining at the finish, a jockey whips the shoulder of his thoroughbred mount. That all of today’s thoroughbreds worldwide descend from just three Middle Eastern stallions highlights the connection between modern racing and the Middle East—a connection Hideki Koike, a counselor with Aramco Asia Japan, determined to make more tangible in Japan by working with the Equestrian Club of Riyadh and the Japan Racing Association to establish the Saudi Arabia Royal Cup. 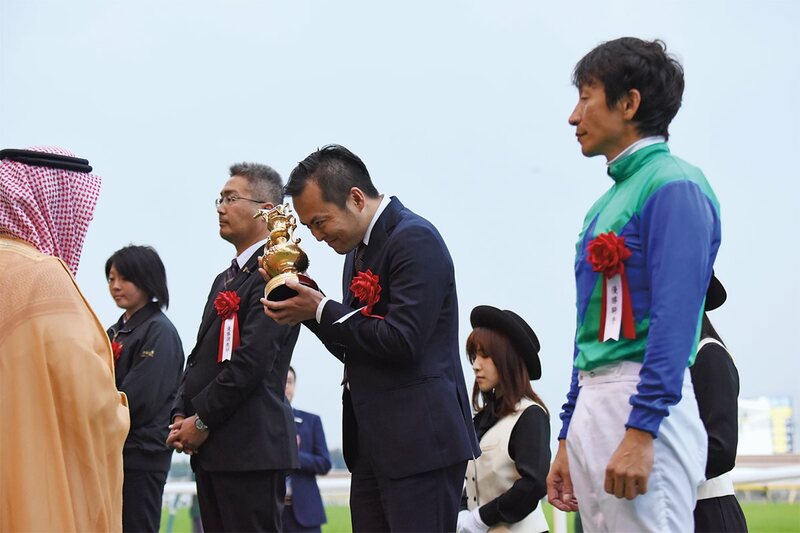 Koike explains that in addition to its purse and trophy, the Cup is also a “prestigious first stepping-stone” in the competition for the annual Japanese Derby. By a nose, Brave Smash crosses the photo-finish line to win the 1,600-meter Saudi Arabia Royal Cup and earn the two-year-old and owner ¥32.4 million ($280,000). 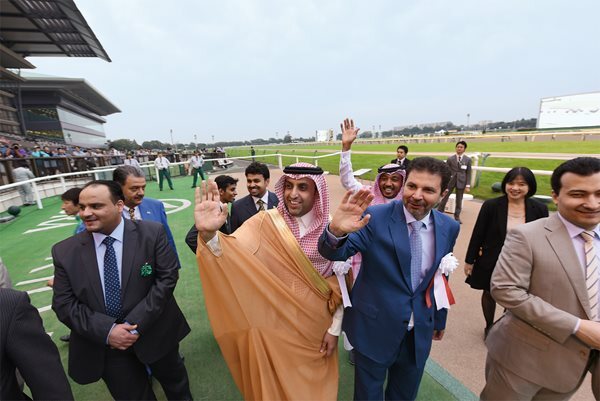 In the winner's circle, victorious jockey Norihiro Yokoyama, far right, looks on as Adel ibn Abdullah Al Mazroa, general manager of the Equestrian Club of Riyadh, far left, presents owner Takaya Shimakawa the 2015 Saudi Arabia Royal Cup trophy. After presenting the Royal Cup, Al Mazroa waves to horse-racing fans and media. Japanese news columnist Yuzo Waki calls the race "one of the most impressive examples of the fact that we share common ground."